Tony Carroll is a dual purpose trainer who generally operates in low grade handicaps and sellers and claimers. Although he has a fairly modest strike rate, the Carroll yard have been behind some big gambles in the past and know the time of day when the money is down. In this report, we primarily dissect Tony Carroll’s flat runners, identifying any circumstances where he excels, or really struggles. 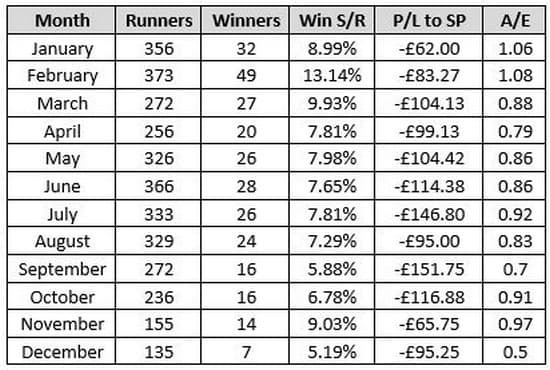 This information can be valuable when assessing whether the Worcestershire based trainer’s runners make solid betting propositions. He does much better with older horses, who have a higher win percentage and a significantly higher A/E. While some trainers can get their horses fit after an extended absence, Tony Carroll is not one of them. His flat performers actually do best with a moderate break from the track; 29-90 days off and they are 79/911 (8.67%) for a loss of £-289 and an A/E of 1.12. By narrowing that down to fancied runners, (i.e. 10/1 11.00 +1000 10.00 10.00 -0.10 and shorter), the loss is turned into a profit, with 67 winners from 392 runners (17.09%) for a LSP of £24.73 and an A/E of 1.24. When the money is down for Carroll runners off this sort of break, it should be respected. Runners returning from a longer absence (90+ days) are usually making their seasonal reappearance, and have a poor record; 12/379 (3.17%) for a loss of £-262. A/E 0.61. They make good laying opportunities. Horses off for more than 2 weeks win just half the races they should do based on odds. Carroll’s runners are most profitable when they won last time out and have been off for 1-2 weeks. There definitely appears to be a method in the madness of the Tony Carroll. He performs best in the first couple of months of the year on the all-weather, when the racing is less competitive. As the months progress into summer his strike rate and returns diminish. Interestingly, he does particularly poorly in December before his runners start firing again in January. Don’t back any Tony Carroll debutants. Follow Carroll’s older horses; his horses 4 and under have a moderate record. 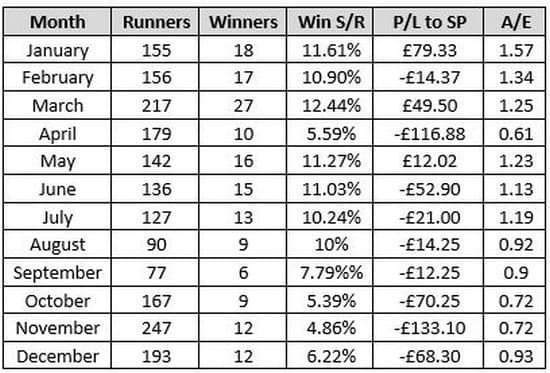 His last time out winners can be decent bets if turned out within 2 weeks, but when they are off the track for longer, they represent poor value and can make decent laying opportunities. Carroll does better in the first few months of the year on the flat and does especially well with his National Hunt horses from January-March. They should generally be scrutinised towards the tail end of the season as the strike rate and returns diminish. His flat runners generally do better after a small break, but have a poor record when off the track for 90+ days.